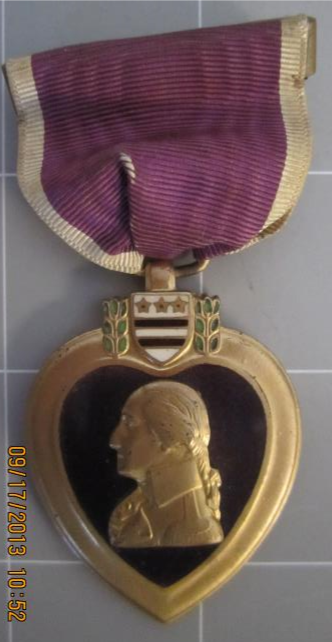 Today’s post, based on a collection at the PA Military Museum (PMM), is from guest blogger Rachel Yerger, one of the Collections Advancement Project curators in the PHMC’s Bureau of Historic Sites and Museums. 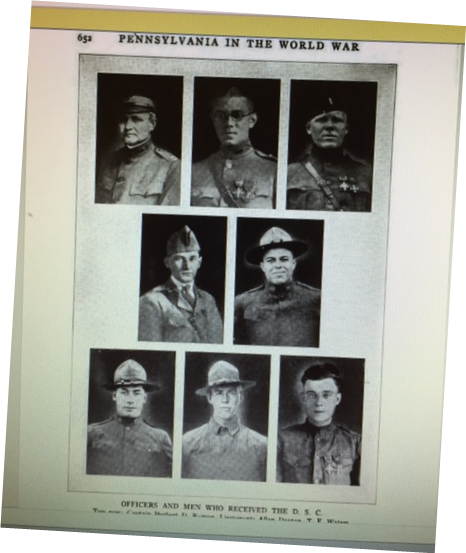 Rachel’s other posts for Trailheads include the story of a collection of WWI letters also held at PMM. As a curator, one of my responsibilities is to catalog donated objects. This often requires research into the objects, as well as the person to whom they belonged. 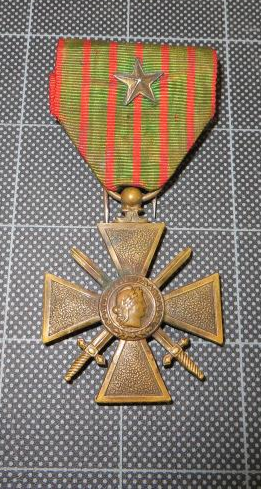 A few years ago, I was lucky enough to work on an impressive collection of World War I military medals belonging to 2nd Lt. Tali Esen Waters. Since we are in the middle of WWI centennial commemorations, I thought now would be the perfect time to share this man’s story of service and heroism. Tali Esen (sometimes written as Taliesen) Waters was born in Nanticoke, Pennsylvania, on March 19, 1894, and was the youngest son of two Welsh immigrants. At the time of his enlistment on August 15, 1916, his occupation is shown as “medical student.” Tali, as he was affectionately known, served as a private in the Hospital Corps of the PA National Guard’s 9th Regiment. He served with the Pennsylvania National Guard on the Mexican Border from September 1916 through March 1917, and when the United States entered World War I, Waters re-enlisted with the 28th Division. Less than a year later, on January 24, 1919, 2nd Lt. Waters would prove himself yet again, this time taking charge of a first aid station 1,000 meters from the German trenches and providing essential medical aid to 46 soldiers, all while under extreme enemy fire. 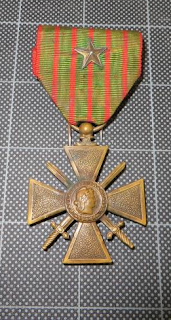 For this act of heroism, Waters was awarded the French Croix de Guerre with a gilt star (photo above). Without a doubt, the war had taken a toll on Waters’s medical ambitions. He and his wife, Isabelle, moved to West Orange, New Jersey, where they lived a quiet and happy life; Tali managed a carpet factory in New York City. It was in West Orange where Tali and Isabelle would befriend the Heselton family. The Heselton and Waters households became so close that upon Tali’s death in 1959, Isabelle gave the Heseltons his military medals. 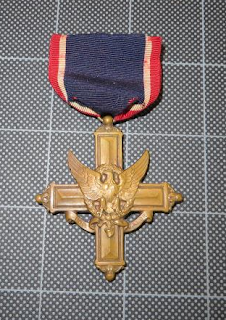 The Heseltons, honoring Tali Esen Waters’s contributions and sacrifices, donated the medal collection to the Pennsylvania Military Museum in 2013. 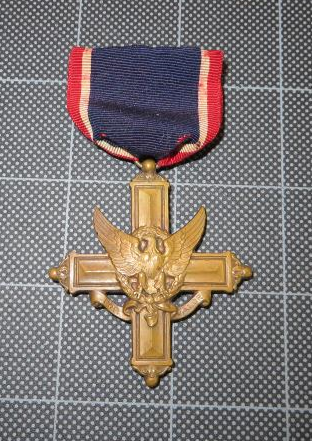 These medals, along with other World War I artifacts and stories preserved at the museum, provide us a with a glimpse into the sacrifices ordinary Pennsylvanian men and women made during The Great War. The September program page has info on events through the end of the month. The October page will be up sometime next week for those of you who want to plan ahead. Ready or not, the autumnal equinox happens today, Sept. 22, marking the beginning of fall in the northern hemisphere and spring in the southern hemisphere. While the warm temps we've had for the past week or so in PA make it still feel like summer, we are seeing signs of fall foliage. Reports are that the colors will be vibrant this year, which makes me happy. Fall is, I think, my favorite season and a mere glimpse of orange, red, and yellow leaves on a hillside can elevate my mood. For my fellow leaf nerds enthusiasts, in addition to following the PA Lumber Museum to see their posts (like the one above) you can check out the PA Dept. of Conservation and Natural Resources. 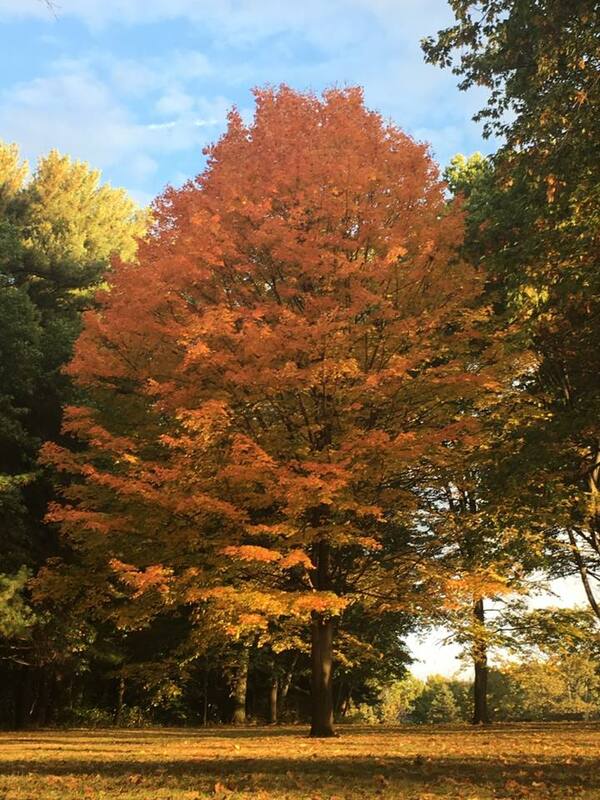 They monitor the state of foliage color in the, uh, state and post reports on their website (report for Sept. 21-27). Speaking of readiness, did you know that September is National Preparedness Month? I did not. This month has certainly tested the preparedness of many people and communities. Sites and museums on the Trails of History have been working to update and maintain their disaster preparedness plans as a matter of good practice, as have our counterparts around the country. To help families with their own preparedness, ReadyPA offers suggestions and guidance on what to include in your personal plans. Google Alerts pointed me to a post on the Misericordia University (MU) website earlier this week. The article noted that senior history major Amber Kelley will present a paper at the upcoming Pennsylvania Historical Association annual meeting in Scranton. Kelley's paper is entitled "American Lithuanian Immigrants' Response to Soviet Union's Attack on Their Cultural Identity." As reported on Trailheads in July Amber interned this summer at the Anthracite Heritage Museum, working with curator John Fielding on a variety of projects, which she chronicled on MU's local history blog. MU's website explains that "AHM has a practice of suggesting its interns consider larger research projects related to their collections. Under [MU history professor Dr. Jennifer] Black's direction, Kelley expanded her summer work and developed the cultural identity research project." Congrats to Amber Kelley, Dr. Black, and the staff at AHM. Atlas Obscura is a wonderful resource for learning about places all over the globe; they frequently feature museums and historic sites that you may not have heard of or visited. A recent post featured the Germantown Colony and Museum in Minden, Louisiana. Turns out the group that settled there in 1835 was originally part of the Harmony Society, whose last home is preserved as Old Economy Village, part of the Trails of History. About a third of the Harmony Society members left Economy in 1832, following the Count de Leon (who claimed to be the Messiah and to have discovered the secret of turning base metals into gold). They initially settled nearby (founding the town now known as Monaca). Some of that group accompanied Leon when he moved on to Louisiana (read the rest). PHMC's Preservation Construction Field Services staff Rob Coates and Dylan Shanta have been making repairs to the porch of the Landis Valley Hotel. 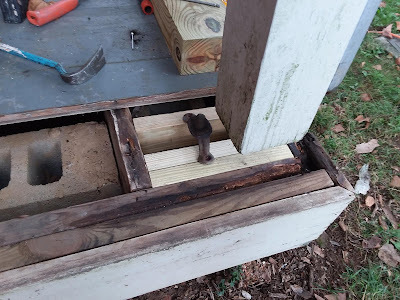 The work involves stabilizing the porch columns (see detail above) and replacing some of the boards. Preservation of historic structures, keeping them available for the public, and sharing the stories of the people who built and used them is an ongoing process that requires resources, dedicated staff, passionate volunteers, and creativity. Sept. 23: Cast Iron Cooking Demonstration—learn about cast iron cooking pots and see them in use. The cooking aromas and demo are free. Regular admission fees apply for tours of the Furnace (see where cast iron comes from). Demonstration 11 am-3 pm; museum is open 9 am-5 pm. Sept. 23: Pittsburgh History Paddle—start with a brief tour of the museum's indoor exhibits, then set off on a kayak tour of landmarks related to Fort Pitt and the Point. Previous paddling experience is required, and you must register through Venture Outdoors. 9 am-1 pm. Sept. 24: Whitemarsh Township History Tour—Hope Lodge will be one of the stops on this bus tour of local history. Tours begin and end at St. Thomas Church, Flourtown (details and info on how to register). Sept. 23: Special programming—this week, Natural History. Included in regular admission, so please start at the Visitor Center. 11 am-4 pm. Sept. 22: Pairings at Pennsbury—ten courses of delicious food from local restaurants and chefs will be paired with local wines, beers, ciders, and spirits for a lovely evening on the grounds. Tickets are $50 per person; check the event page on the website for more info. 6-9 pm. Sept. 24: Special programming—this week, Beer Brewing Sunday will find the brewers working on a traditional fall beer PLUS you can learn about the past, present, and future of cider. Included in regular admission. 1-4 pm. Sept. 23-24: Then & Now Military Timeline Program—explore a range of military uniforms and equipment from the 18th century to the present. Battle dress uniform show and weapons demos at 1 pm each day. 10 am-4 pm. Sept. 23: Smithsonian Magazine Museum Day—visit the Museum Day website to download your ticket, then present it at the Railroad Museum (or other participating museum) for two free admissions. Museum open 9 am-5 pm. The September program page has info on events coming up this weekend through the end of the month. There have been some updates to the page since it was initially posted, and I've highlighted some events below. Last Friday in Austin, TX, two Trails of History sites were honored with Leadership in History Awards from the American Association for State and Local History (AASLH). 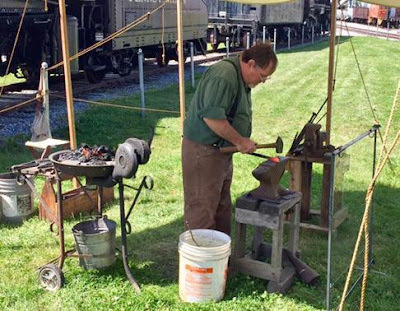 AASLH honored The State Museum of PA for its exhibit on the history of the Pennsylvania Turnpike and the Somerset Historical Center for its recent publication, Shade Furnace: An Early 19th-Century Iron Making Community in Somerset County, Pennsylvania. Congratulations! A reenactment of the Battle of Brandywine is on tap for this weekend at Sandy Hollow, Birmingham Township (more details on the web). The folks at Brandywine Battlefield Park have been involved with a host of other organizations to plan this event in honor of the 240th anniversary of the battle that took place on September 11, 1777. On the actual anniversary, a cast of historical characters tweeted throughout the day to provide multiple perspectives in real time (well, real time 240 years later). I wasn't able to follow the whole day, but checked in from time to time. I thought it was pretty compelling and very interesting. It garnered some good attention from other Twitter accounts as well, which expanded the reach of the project. Search #BoB1777 on Twitter to see the tweets. Last week, Philadelphia's CBS affiliate, CBS3, had an exclusive report revealing the names of Pennsbury Manor's recently adopted lambs. Reporter Vittoria Woodill met Lavender and Sage and spoke with staff and volunteers about the site and the animal program. You can watch the report below or find it at CBS Philly's website. Sept. 16-17: On Hallowed Ground—to commemorate the 240th anniversary of the Battle of Brandywine, Birmingham Township is presenting a two-day reenactment event. Please note that the event takes place at Sandy Hollow, not at our Trails of History site (loads of details are available on the event website). Sept. 16-17: Change in weekend schedule—the site will be closed on Sat., Sept. 16, but open on Sun., Sept. 17, noon-4 pm. Sept. 16: Fall Gas Up—the museum hosts the Pioneer Steam and Gas Engine Society's display of antique gas engines, oil field and farm equipment, and more. 9 am-3 pm. Sept. 15: An Evening with the Graemes—enjoy an evening of 18th-century entertainment, including dancing, card games, skits, and refreshments. Children age 13 and older are welcome to attend. Tickets are $12 and may be purchased on Eventbrite. Period attire is welcome but not required. 7-9 pm. Sept. 17: Living History Sunday—today's event explores slavery in colonial Pennsylvania and at Graeme Park. The Keith and Graeme families were slave holders, as were many of their contemporaries. Noon-3 pm. Sept. 17: Site open—enjoy the grounds and take a guided tour of the mansion. Admission charged. 1-4 pm (tours at 1:00 and 2:30 pm). Sept. 16: Wool Frolic—celebrate the fiber arts and the people, plants, and animals that make them possible. Enjoy activities for the kids and shop for deals on yarn, patterns, and paraphernalia. Admission charged. 10 am-4 pm. Sept. 16: Saturday programming—this week's offering is Decorative Arts. Included in regular admission, so please start at the Visitor Center. 11 am-4 pm. 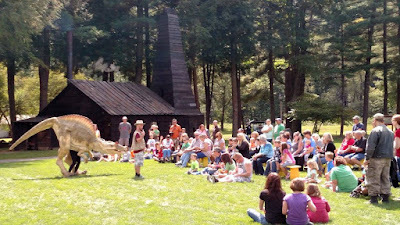 Sept. 17: Sunday programming—this week, Open Hearth Cooking features the bake oven. Included in regular admission. 1-4 pm. Sept. 17: 3rd Sunday Program—this month's program is "The CCC in World War II." Mike Schultz, author of From the Forest to the Battlefield: Forty Civilian Conservation Corps Members Awarded the Medal of Honor during World War II, will discuss ways service in the CCC prepared enrollees for wartime military service. He will be joined by John Eastlake, retired DCNR forester and fellow CCC historian. 1-3 pm. Sept. 15 and 17: Fort Hunter Excavations—this month's 3rd in the Burg will take place at Fort Hunter Sept. 15 from 4 to 6 pm, and archaeologists will be on hand Sept. 17 for Fort Hunter Day. The September program page shows lots of great stuff happening on the PHMC's Trails of History this weekend and the rest of the month. From 10:30 a.m. to noon on Wednesday Sept.13, take part in Ask A Curator Day by tweeting your questions to Johnson @PHMC via Twitter. Make sure to include the #AskACurator hashtag. From Howard Carter to William F. Albright, archaeologists and the captivating artifacts they uncover have fascinated the public for years. Often, people conjure up romanticized images of fedora hat-wearing archaeologists who grip fiery torches as they explore shadowy tombs. Tombs and torches really don’t define modern archaeologists; however, many do wear hats…just not fedoras. Not convinced? Here’s your chance to quiz an expert. Next week, dig deep into the working lives of Pennsylvania archaeologists via Janet R. Johnson, a curator with The State Museum of Pennsylvania’s Section of Archaeology. Johnson, who curates and manages roughly eight million artifacts uncovered throughout the Commonwealth representing 14,000 years of occupation, has volunteered to take part in Ask A Curator Day from 10:30 a.m. to noon on Wednesday, Sept. 13 on Twitter via @PHMC. To date, more than 1,400 museums from 57 countries have signed up for Ask A Curator Day (#AskACurator), a world-wide social media event that engages the public and connects them with museum curators. Essentially, Ask A Curator is a Twitter-based Q & A that serves as a venue where curators can chat with the public about nearly anything that piques their curiosity. Questions may range from the silly (“Are all archaeologists afraid of snakes?") to the more serious (“How do you know where to dig?”). 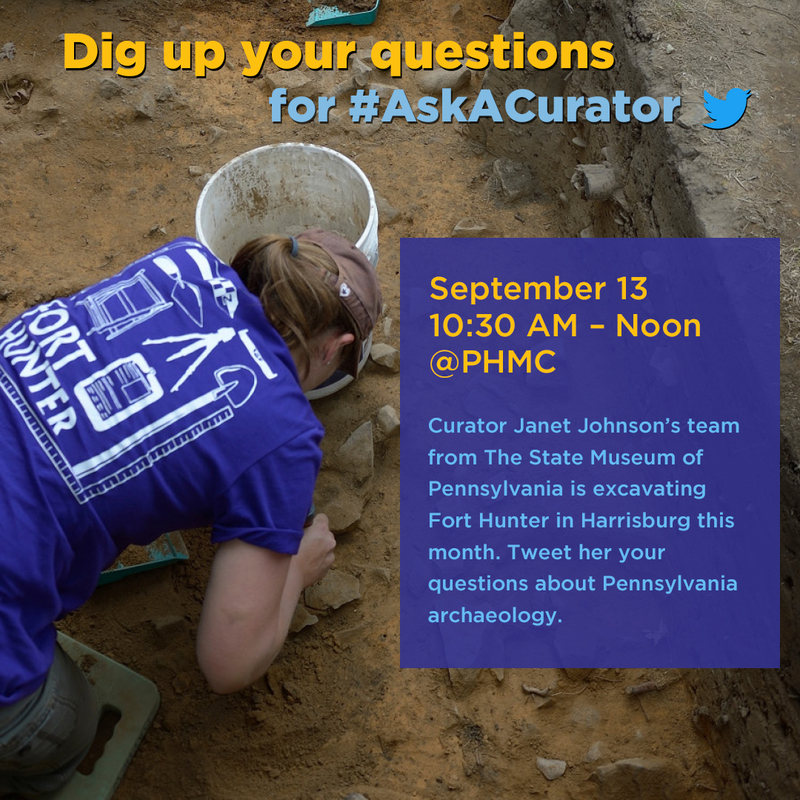 From 10:30 a.m. to noon on Sept.13, take part in Ask A Curator Day by tweeting your questions to Johnson @PHMC via Twitter. Make sure to include the #AskACurator hashtag. On Sept. 13, you can also share with us your photos and videos. Often, people relate stories about how and where they found a specific rock or artifact. Curators want to learn those histories and, in the process, might be able to offer a few previously unknown facts and interpretations. This month, Johnson and her crew from The State Museum are excavating the Fort Hunter Mansion & Park near Harrisburg. The overall goal is to locate the remains of a French and Indian War-era supply fort occupied between 1757 and 1763. The public is welcome to visit and archaeologists will be on site weekdays between 9:00 a.m. and 4:00 p.m. until Friday, Oct. 6. In addition, the site will be open on Sunday, Sept. 17, for Fort Hunter Day. This year, archaeologists from The State Museum will focus on two areas of Fort Hunter. The first is an area west of the milk house that was encountered in 2008 and again in 2016. It consists of two layers of artifacts dating to the late 18th and/or early 19thcenturies, based on previously uncovered ceramics. Another area archaeologists will investigate is a rock foundation that has been interpreted as the octagonal smokehouse described in the 1820s in a farming magazine. For more details on this year's Fort Hunter excavations or other news, please follow PHMC's "This Week in Pennsylvania Archaeology" blog. The September program page has the info you need to plan your weekend. If you'll be on the Trails of History on Monday, please check the list of sites scheduled to be open for Labor Day. There's been lots of activity at Pennsbury Manor recently, judging from their Facebook page. They adopted two lambs and are currently accepting votes via Facebook on names for the pair (either "Sage and Lavender" or "Admiral and Lady"). They are also raising funds online to help pay for veterinary care for the lambs and other animals at Pennsbury (you can help by visiting their Crowdrise page). 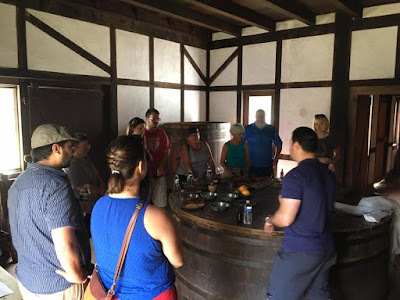 I also saw on Facebook that Pennsbury, in conjunction with its brewing program, offered a workshop last Sunday on making your own bitters (see photo below). The workshop sold out, but more are planned. Pennsbury's volunteer newsletter noted that the site has partnered with Waste Management to create a garden outside the gate to support several species of pollinators. Citizen scientists from the Pennsbury staff and volunteer corps are participating in an effort to monitor the monarch butterflies, bees, and other species over the summer; the efforts will continue through late October. In other programming highlights, Eckley Miners' Village drew a crowd of 480 people on a Friday for a free day earlier this month. Thanks to funding from the Buncher Foundation they were able to offer transportation to the site from Hazleton in addition to waiving ticket fees that day. You can read more about it in an article from the Standard Speaker. Drake Well Museum added a geology and paleontology component to their annual Drake Day celebration, marking the anniversary of Col. Drake's successful oil well. They shared photos on Facebook (including the one below). Ephrata Cloister is looking for singers interested in adding their voices to the Ephrata Cloister Chorus, now in its 58th year. Founded in 1959, the chorus has performed selections from the 1,000 hymns and chorales composed by Conrad Beissel and others in the Ephrata community during the 1700s. In concerts across the eastern U.S. and in Europe, the group has also presented a variety of other classical and contemporary songs, including music from other early American religious communities and traditions. New singers of all vocal parts are invited to attend rehearsal on Sept. 5 or Sept. 12 to meet the director, Martin Hinkley, and get a sampling of this season's musical selections. If you'd like to take part, please call Ephrata Cloister at 717/733-6600 for additional information.